When vacationing or on business to Tucson, experience the southwest to the fullest by staying in a beautifully furnished 2 bedroom, 2 bath second floor condo nestled in the foothills of the Catalina mountains. This condo is located adjacent to the Loew’s Ventana Canyon resort, famous for its fabulous golf course and spas. The condominium complex has two pools and hot tubs, two clubhouses, an exercise room, a tennis court, and a fully stocked business center with computers (with high speed internet connections), copiers, scanners, and faxes for those who need to stay in touch with work. The resort-style grounds act as an introduction to the beautiful Sonoran Desert. If you’re adventurous, you’ll note that the complex has an access to the highly regarded Ventana Canyon trail. You can follow this trail up to some beautiful pools for a memorable picnic, or if you’re feeling hardy, continue on to the 'Ventana' or window which can be seen from all of Tucson! The next morning, enjoy a cup of coffee at the tile table on the balcony while gazing at the beautiful Catalina Mountains and identifying the many species of birds you’ll see in the tops of the abundant mesquite and palo verde trees. If you wish to explore the area, visit the famous Sabino Canyon Recreation Area, which is only minutes away. Or enjoy pie and coffee (and cooler temperatures) with a 30-40 minute drive up to Mt. Lemmon. In the winter, there is even skiing at the Mt. Lemmon ski area. The condo is fully furnished in Old Mexico/Southwest styles. You will find linens, a king and a queen bed, blankets, kitchen supplies, DVD/VHS player, grill, etc. All you need to bring is yourself and your suitcases. We live in beautiful Tucson and enjoy lots of different activities. We like to hike and spend time with our young children Zach, Hannah, and Samuel! Tod is an Electrical Engineer and Catherine is a 'retired' college professor of English as a 2nd Language. We've owned and rented out this unit since 2003 and have met many excellent people through this small business. We'd love to have you stay at our condo! We think that Ventana Canyon is the most beautiful part of Tucson. The property has access to the Ventana Canyon trail, which some of our guests report they have hiked some portion of each day they stayed in our condo! The unit is a 2nd floor unit, which means better views and a quieter stay for our guests (no noises from above). We bought this property back in 2003 because the location was tops in the Tucson valley. There are no properties between this complex and the beautiful Catalina mountains. Our condo is very pleasant and luxurious. We have saddle leather furniture, a king size bed in the master bedroom (with a really good mattress! ), and lots of artwork and other details that make our unit a very distinctive place to stay. Walking distance to the famous Loews Ventana Resort and all its amenities. Views of the Catalina Mountains from the rear veranda. located in common area of the complex, not our actual unit. various items, trash bags, etc. Granite countertops, new, stainless sink, etc. Stairs extend to the 2nd floor units in this complex. No elevators. We had a wonderful time here during the month of March, 2018. Loved the easy access to the hiking trails. We enjoyed relaxing in the heated pool & spa after our hikes. The condo had a well equipped kitchen, comfortable bed & sofa, very clean, updated, and nice views. Todd & Catherine were very accommodating & easy to work with. All the people we met in this complex were very friendly. We would definitely recommend this condo and hope to return sometime. Thank you Todd & Catherine for the use of your condo. We enjoyed our month at Tod and Catherine’s condo. Everything was as pictured. Nicely decorated, comfortable and well stocked. The owners were easy to work with and quick to respond. The complex is in a wonderful location in the foothills. The unit is tucked in the treetops and convenient to the trail for hiking. We hope to return in 2 years. We are so glad you enjoyed your stay and took advantage of the adjacent Ventana Canyon trail for hiking. We look forward to seeing you again in a couple of years! We have savored every day of our stay here. The location of this condo can't b beat. . . Ventana trail right out the door, Sabino Canyon not much further. The condo is well equipped, beds very comfortable, washer and dryer ever so handy. We used the gym and enjoyed gathering with friends in the clubhouse. And we loved the quiet, walking through the complex each evening, listening for the owls and looking up into a starry sky. The only thing I would change is the patio furniture as we found it too uncomfortable to use for very long. Tod and Catherine are hospitable hosts, responding graciously when we had questions. Thank you both for a delightful month! My friend and I rented this condo for the month of January 2016, and were very happy with the experience. The condo is well equipped with everything you might need, very well kept, and comfortable.- especially the excellent beds for a good night's rest. Also important for us was the peace and quiet around the whole complex.. Most pleasant, and allowed for many relaxing hours by the pool. The condo is on a trail head, especially helpful for us, as we could just walk outside and be on the trail immediatly. It is a fantastic hike with gorgeous views.. Not to be missed! Tod and Catherine responded immediately to any questions we asked and were there to show us around. Thank you so much for your kind attention! If you love hiking , tennis or cycling or just relaxing under the beautiful Tucson sun this is a great place to be., and having a lovely place to come home to at the end of the day , try this place! Far enough off the beaten path so that there is a desert feel to it, yet close to the other amenities Tucson has to offer. We would certainly go back again! I rented this beautiful condo for 2 months... & could have just moved in! Furnishings & beds were super comfortable, kitchen was stocked well so I was able to cook often. Great little balcony facing the courtyard, out of the hot sun & quiet little oasis to read & relax. Covered carport right next to the unit. The owners were wonderful to work with, and prompt on getting back to me. Activities: Easy access right from the parking lot to the Ventana Canyon Trail... a lovely walk. Took daily walks along the River Rd "wash". Enjoyed meals at Scordato's (River Rd & Campbell), Renee's a Organic Oven, Frost (gelato), Poco & Mom's (New Mexico cuisine) & Jethro's Cafe (diner) on Broadway. The Gem Show in February is amazing! So, too, the Sonoran Desert Museum. 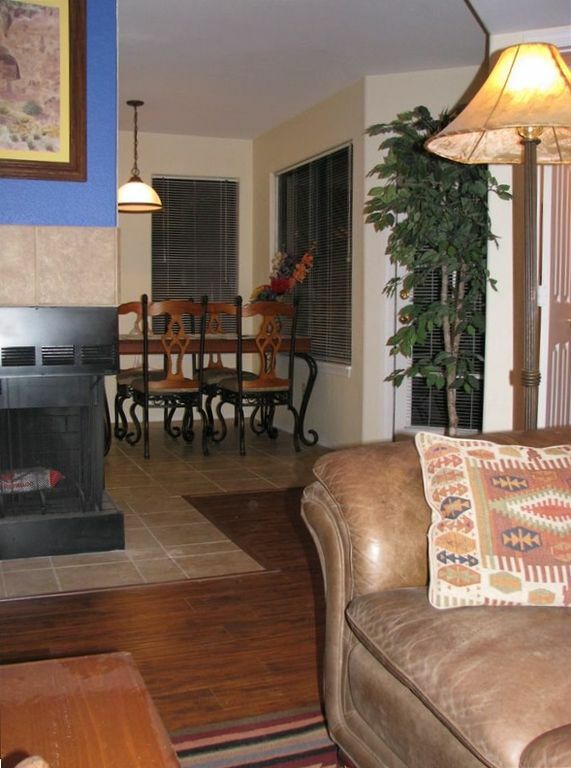 This condo is a charmer, beautifully furnished and decorated in Southwest style. The location is a real winner. The kitchen, however, while adequate is beginning to show its age. Pots, pans and some utensils are scorched and the cabinets call for some reconditioning. Overall the amenities of the unit along with the common area are highly enjoyable. Thanks for the nice comment! We are already working to fix the issues you have addressed. Have a great stay! Following up, we have put a lot of energy into sprucing up the kitchen. Pots and pans are now Calphalon. Utensils have been replaced, along with appliances such as coffee pot, toaster, etc. The cabinets have all been restained and sealed. Thanks again for your review! This community is a resort-like community located at the base of the Catalina mountains. Excellent biking throughout the area as well as one of two total accesses to the excellent Ventana Canyon trail through a locked gate on the complex property. Payment terms - $390 for fees/deposits due at booking. The rent is due 60 days prior. Contact owner for full policy sheet, which lists details not possible to show on this site, as well as booking instructions.